Natures Aid Folic Acid contains 400mcg of Folic Acid. Folic Acid may contribute to material tissue growth during pregnancy and to the normal function of the immune system. 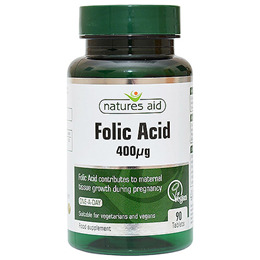 Below are reviews of Natures Aid Folic Acid - 90 x 400mcg Tablets by bodykind customers. If you have tried this product we'd love to hear what you think so please leave a review.